BONE CONDUCTION BLUETOOTH HEADPHONES: different from traditional earphones by creating mini vibrations, sending sound through the cheekbones directly to the cochlea in your inner ears. These new technology will also help people with Recession Type Hearing Impairment to listen to and enjoy music. Helps to avoid hearing loss from ordinary earphones due to long time usage. 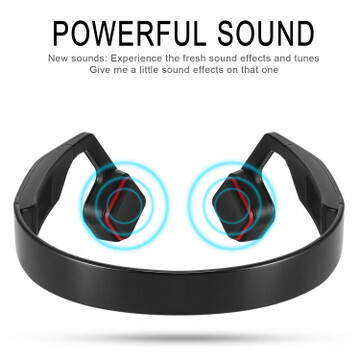 BEST HD SOUND WITH SOUND LEAK-PROOF DESIGN: With our new smart open ear bone conduction headphones you can enjoy heavy bass and crystal clear treble while listening to your favorite music. Feel the difference the traditional headset or earphone cannot offer with this bone duction listening mechanism! You will throw away all your other headsets guarantted! LATEST BUILT-IN BLUETOOTH V4.0: Upgraded wireless Bluetooth V4.0 with wide connection up to 30 ft, more faster, secure and stable connectivity. It can connect 2 devices simultaneously and compatible with almost all Bluetooth-enabled devices. SWEETPROOF, DUSTPROOF AND OPEN EAR HEADPHONE: Perfect for outdoor activity lovers to ensure their health and safety. Sweetproof, moisture and drip resistant headphone for indoor and outdoor sports activities.Ensure safety as you can listen simultaneously to music and your surroundings, perfect for runners, cyclists, hikers and drivers on the road. 6 hours of music and/or calls with complete inline controls. OPEN-EAR DESIGN SPORT HEADSET: Open-ear bone conduction headphones are designed so you do not need to plug or cover your ears as traditional earphone or headphone requires. No more headphone wearing discomfort that in-ear or over-ear headsets will bring. Protect your hearing and keep your eardrum healthy without the fear of lossing hearing due to long time use.